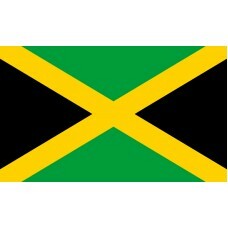 The Jamaican flag features the colors gold, green, and black. A gold diagonal cross (referred to as a saltire) divides the flag into four triangular sections. The top and bottom triangle are green in color and the two side triangles are black. The gold color represents the wealth of the country and the sunshine, the black color represents the hardships and struggles, and the green color represents the land and Jamaica's agriculture. 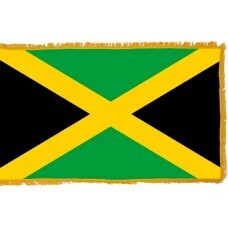 The Jamaican flag motto is: "Hardships there are, but the land is green and the sun shineth." The Jamaican flag was adopted on August 6th, 1962, when the country gained independence from the United Kingdom. There are only two national flags that do not include the colors red, blue, and white - Jamaica is one of them and Mauritius is the other. 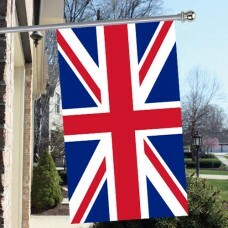 When the flag becomes worn and must be replaced, it should be burnt privately and should not be used for any other purpose than that for which it was designated. Do not raise any foreign flag publicly unless the Jamaican flag is also flown, except at foreign embassies, consulates and missions. 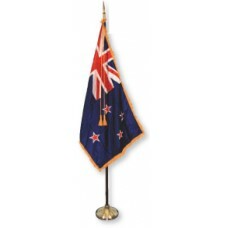 The flag shouldn't be draped over vehicles, except on military, police and state occasions. In 1494, after Christopher Columbus landed in Jamaica, the country came under Spanish control and became known as "Santiago" until 1655, when it came under British control. Whilst it was under British rule, it became the biggest sugar exporter in the world. Jamaica was the first country in Africa to gain independence from the UK. Jamaica is an island country and is the 3rd largest island in the Caribbean Sea. The largest city and capital city of Jamaica is Kingston and the second largest city is Montego Bay, also referred to as the "tourist capital" of Jamaica. The main and most important industry in Jamaica, is tourism. It has been voted for many years as one of the 5 top tourist destinations. Jamaica has approximately 50 public beaches on the island and the main one that tourists like to visit is, Doctor's Cave Beach. This is the most famous beach on the island as is renowned for its turquoise waters and white sand. Another very popular tourist attraction is the Dunn's River Falls, which features waterfalls that are terraced like stairs and climbing them is a popular activity. There are also three Dolphin Coves on the island where people can swim and interact with dolphins, sharks, and stingrays. The final major tourist attraction is the Bob Marley museum which is located in Kingston and attracts millions of visitors each year.